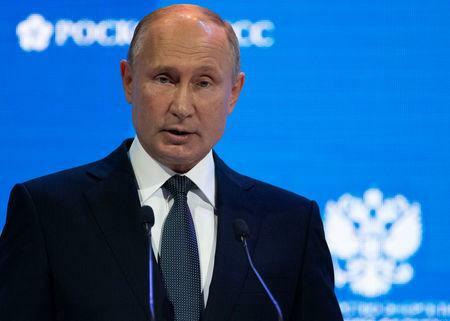 "I see that some of your colleagues are pushing the theory that Mr Skripal was almost some kind of human rights activist," Putin said at an energy forum in Moscow when asked about the case. "He was simply a spy. A traitor to the motherland. He's simply a scumbag, that's all," Putin added, in remarks that drew applause from parts of the audience. British officials say the poisoning was carried out by Russia's GRU military intelligence agency almost certainly acting with the approval of Russian officials. Russia has denied that. "What, did some guys rock up and start poisoning homeless people over there?" said Putin, repeating a description of Sturgess and her partner used by some Russian state media. "What rubbish." "We didn't need to poison anyone over there. This traitor Skripal was caught, he was punished and did five years in prison. We let him go, he left the country and he continued to cooperate there and consult some intelligence services. So what?" London says their explanation is so far-fetched as to all but prove Russia's involvement, while investigative website Bellingcat has published a picture of a decorated Russian military intelligence colonel it named as Anatoliy Chepiga who resembles one of the two men Britain caught on CCTV. "Did problems between intelligence services start yesterday?" quipped Putin. "As is well known, espionage, like prostitution, is one of the world's oldest professions."